"[A] brilliant book...by far the best study yet" (Paul Kennedy, The Wall Street Journal) of the gripping history behind the Marshall Plan and its long-lasting influence on our world. In the wake of World War II, with Britain's empire collapsing and Stalin's on the rise, US officials under new Secretary of State George C. Marshall set out to reconstruct western Europe as a bulwark against communist authoritarianism. Their massive, costly, and ambitious undertaking would confront Europeans and Americans alike with a vision at odds with their history and self-conceptions. In the process, they would drive the creation of NATO, the European Union, and a Western identity that continue to shape world events. Benn Steil's "thoroughly researched and well-written account" (USA TODAY) tells the story behind the birth of the Cold War, told with verve, insight, and resonance for today. Focusing on the critical years 1947 to 1949, Benn Steil's gripping narrative takes us through the seminal episodes marking the collapse of postwar US-Soviet relations--the Prague coup, the Berlin blockade, and the division of Germany. In each case, Stalin's determination to crush the Marshall Plan and undermine American power in Europe is vividly portrayed. Bringing to bear fascinating new material from American, Russian, German, and other European archives, Steil's account will forever change how we see the Marshall Plan. 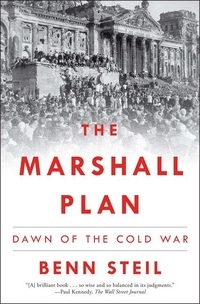 "Trenchant and timely...an ambitious, deeply researched narrative that...provides a fresh perspective on the coming Cold War" (The New York Times Book Review), The Marshall Plan is a polished and masterly work of historical narrative. An instant classic of Cold War literature, it "is a gripping, complex, and critically important story that is told with clarity and precision" (The Christian Science Monitor).